The price is very important to make these microphones affordable for a wider range of users. It doesn't mean we build it cheap or we “impoverish” it somehow in quality. Construction is comparable with the most expensive microphones and we use old pure technologies like point to point soldering of all sensitive parts on a special base, output transformer with size and materials like in tube version, our F7 capsule skinned by skilled German technicians. All contacts and soldering pins are gold plated, output connector is made by reputable manufacturer – Neutrik. The passive components are meticulously selected and tested before they are used. The complete microphone is manually equipped and wired. The microphone heads are absolutely compatible with the FLEA 47, FLEA 48 or original U47/U48 microphones. The quality of the sound was always the priority to us, our microphones are long time tested in cooperation with famous sound engineers and musicians all over the world and only when we were pretty sure the result is uncompromising we decided to open the door and revealed these babies. All measurements were verified by independent company to avoid any misleading information and results. Why the FLEA 47 SUPERFET model and the FLEA 48 SUPERFET model? When we look into the past, it's clear that the original U47 is the most wanted microphone ever in the music industry. Sound of this microphone is amazing on almost everything – vocals, acoustic instruments ... Moreover, if you have a pair, you can realize A/B, X/Y, ORTF stereo techniques. 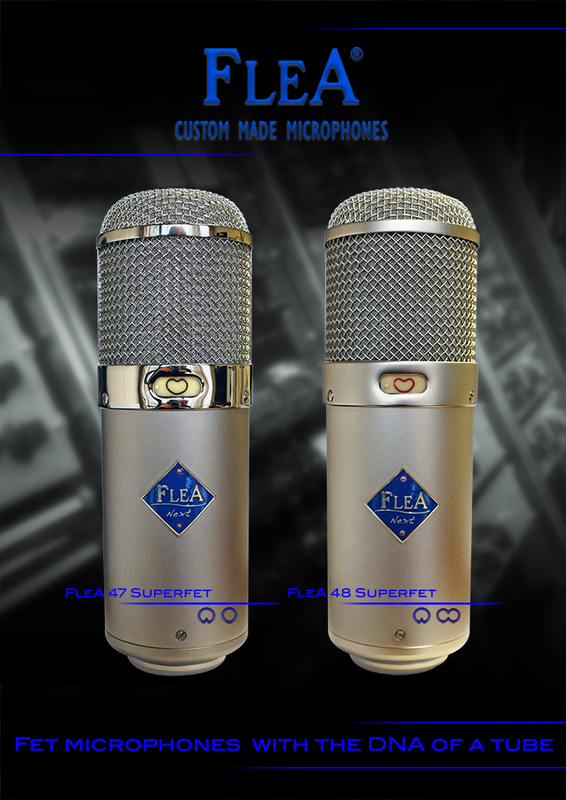 FLEA 47 SUPERFET offers exactly the same, both cardioid and omni patterns. And having a pair of them opens the doors for all the mentioned stereo techniques above. But the 48 is the gun too. A lot of sound engineers are looking for the 48 because of its incredible sound on vocals or voiceovers in figure-8 pattern. A lot of them are willing to own all patterns to get a variable sound and to be able to experiment in studio. This unique sound of the 48 is historically proved by the famous studios like Abbey Road, Capitol, etc. And again, if you have a pair, the doors are open for Blumlein or M/S techniques. Now, you can select, the FLEA 47 SUPERFET or the FLEA 48 SUPERFET or both. No compromise. We stand behind the quality of these microphones on 100% and therefore we offer 5 years warranty* on our SUPERFET. To keep your microphones safe, our standard packaging includes handmade oak wooden box for the microphone. The part of the standard package is also our heavy duty shockmount. Start using the SUPERFET now and get an uncompromising sound for your record! * Excluded the Neutrik connector which is subject to Neutrik manufacturer's warranty. This warranty does not cover damage due to misuse, damage in transit, accident or neglect, forcible damage, unprofessional handling damage or any other damage from operation which can make product non-functional.